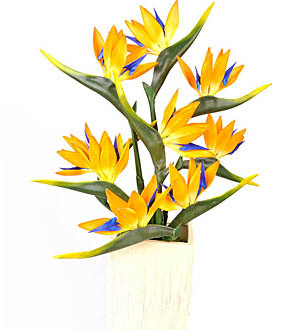 Elegance and originality are the keynotes of this Bird of Paradise Flower in a Tall Muse Vase arrangement. Chic and very stylish, the Tall Muse Vase is lined with Bird of Paradise Stems. Cool and modern - without being consciously trendy - this new look for Bird of Paradise show all the signs of becoming a contemporary classic. Delicate and pretty, the faux flower used in this arrangement is from Fleurwood - Natural Latex Yellow Bird of Paradise Flower. Detailed and beautifully realistic, it adds a wonderful touch of glamour. The real beauty of natural foam flowers is that they last forever; season to season in perfect bloom with no watering, pruning or wilting. At Giftlab we are passionate about imitating nature with absolute precision, and that's why we study real flowers and plants as a reference for each design. The results are blooms so lifelike that even the bees are fooled! Bird of Paradise available in Yellow and Orange. Botanists call it Strelitzia reginae but to anyone with an ounce of romance in their soul, Bird of Paradise seems more appropriate. Look closely at the flowers and you'll see why. They have a unique shape - like a bird's head complete with beak and erect plumage. Truly exotic - they're native to South Africa - natural bird of paradise plants are fairly demanding. Our version thankfully isn't. Easy to love, easy to live with and designed to look sensational for years. Each stalk of Bird of Paradise measures 82cm in length and the flower measures approximately 21cm. Flower Arrangement measures approximately 87cm in height with a diameter of 59cm.